US stocks came very close to entering a bear market on Christmas Eve, which was a very bad thing. Just about everybody said so. What happened in December? By December 24, the S&P500 had fallen 19.8 per cent from its peak of September 2018. That was just short of the “traditional” 20 per cent slide that many say defines a bear market. It has been strongly up since then, but still remains down substantially from that peak. This tradition doesn’t amount to much, though. I discovered, through digital search, that the practice of using precise definitions for down markets — denoting a “correction” as a 10 per cent decline from a peak and a “bear market” as a 20 per cent decline — is only a little over 30 years old. People have spoken loosely of bear markets for more than 100 years, but they didn’t generally attach a 20 per cent definition to them. You might think that the precise identification of a bear market occurred because that 20 per cent threshold is intrinsically important — because, for example, there are many times when stock market declines stop at around 20 per cent. But, actually, that is not a frequent occurrence. In this century, since 2000, there have been exactly two S&P 500 declines of 20 per cent from the market peak — and both of them continued much further, for a net decline of around 50 per cent. The first such decline started in 2000. The S&P 500 peaked on March 24 of that year but by March 12, 2001, it had declined 20 per cent, and newspapers duly called the situation a bear market. Sometimes the wording suggested the market was nearing its bottom. Writers didn’t know the decline was over, but evidently felt comfortable joking about it: “Bear Country Good Territory for Stock Hunting,” one headline said. That lighthearted approach was unfortunate because the S&P 500 turned out to be less than halfway through its decline. Ultimately, from its 2000 peak it dropped 49.1 per cent through October 9, 2002, before turning up. In real terms, correcting for inflation, that was more than a 50 per cent price drop from peak to trough. Then there was the stock market of the Great Recession. The S&P 500 peaked on October 9, 2007. It became a bear market, having declined over 20 per cent, on July 11, 2008. There were lots of bear jokes that July, with suggestions that the start of a bear market signalled the end of a process: “Stop Worrying and Learn to Love the Bear,” was the headline of a “Wall Street Journal” article then. Still, the market kept going down, and bottomed on March 9, 2009, after losing 56.7 per cent of its peak value. Those two episodes tell us something important: The start of a bear market doesn’t mean much. From a historical perspective, it is clear that a 20 per cent decline does not predict further market movements with any certainty. That may not have been obvious between 1980 and 1990, when the 20 per cent definition of a bear market first became established, because there were then two fairly recent 20 per cent declines from S&P 500 peaks that did not precede sharper falls. On March 3, 1982, after dropping 21.1 per cent from a November 28, 1980, peak and entering what we would now call bear market territory, the S&P 500 fell only 6 per cent further. And after a one-day S&P 500 decline of 20.5 per cent on October 19, 1987, the index fell only 0.4 per cent further to a trough on December 4, 1987. In short, the mere diagnosis of a bear market doesn’t seem to carry much weight for forecasting future price drops. Yet let’s not dismiss the effects of a bear market declaration too soon. Simply by announcing that we have entered a bear market and repeating that claim in the echo chamber of social media, the designation itself might create psychological unease that could make for market volatility. Consider the “Charging Bull” sculpture, symbolising the bull market vigour of the financial markets, by Arturo Di Modica. It was first installed in 1989 in the aftermath of the 1987 stock market crash, in Bowling Green in the financial district of New York. The initial installation of the bull statue caught the popular imagination. It was the second time, according to Google Ngrams, that “bull” and “bear” were really widely used (the first time being in the boom of the 1920s and the 1929 crash). The statue may be the second most famous sculpture in New York, after the Statue of Liberty, and tourists flock to take selfies with it. It is a symbol of much more than a market direction. According to the sculptor, the statue also symbolises “the strength and power of the American people”. It has become an icon of national identity, patriotism and animal spirits. By the same token, the notion that a bear market may be around the corner can be profoundly disruptive. 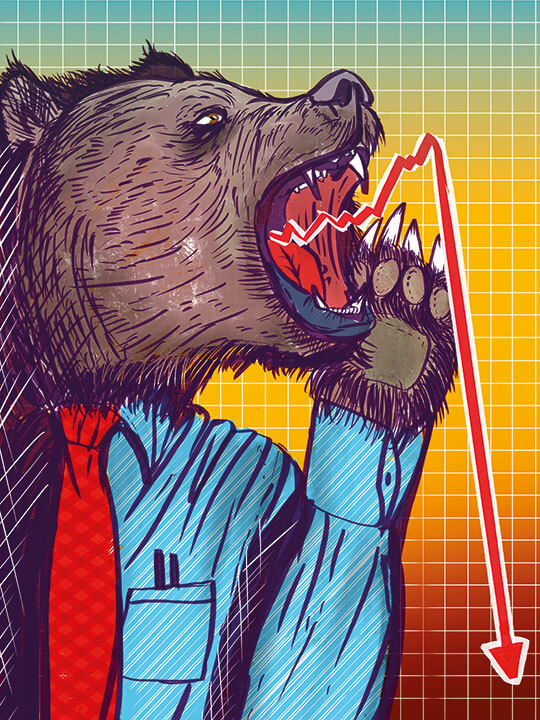 The near-miss diagnosis of a “bear market” on Christmas Eve 2018 seemed to have struck fear and disorientation in many investors, like an inconclusive lab test for a dread disease, making people vulnerable to more pessimistic feelings.